We offer two powerful lead generation software solutions to accelerate your sales or marketing B2B lead funnel growth. 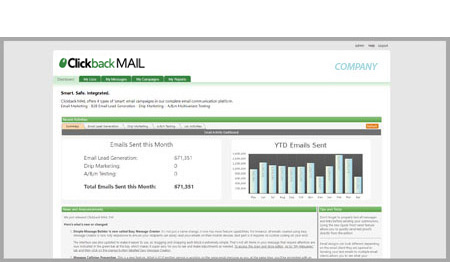 Our email lead generation software, Clickback MAIL, lets you email your purchased list of cold contacts turning them into warm opted-in leads – something your marketing automation software and other email service providers won’t let you do. Start driving more targeted leads into the funnel to nurture and close. 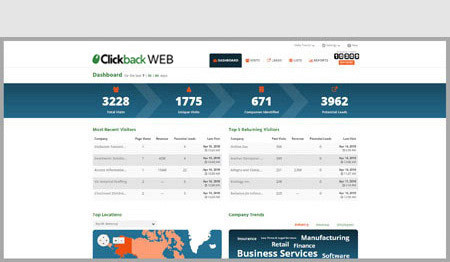 Our website visitor tracking software, Clickback WEB, is the ultimate sales prospecting tool. It provides you with the names of the companies that have visited your site but didn’t convert. Stop cold calling prospects who don’t fit your ideal buyer persona, and spend less time chasing unqualified leads. At Clickback, we’re fanatically obsessed with helping B2B companies ignite their lead growth. Our cloud-based lead generation software helps B2B companies keep their marketing and sales pipelines topped up.